The painting of Donald Bradman that hangs in the meeting room of Aurora Funds pays homage to the mantra of the modern hedge fund. 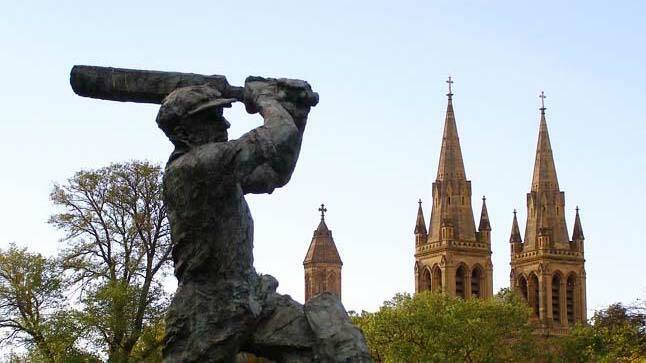 Every Australian knows – and was once even expected to know as a right of citizenship – that Sir Donald has the highest batting average of any test cricketer at 99.94. But not many are aware of how few occasions Sir Donald cleared the boundary ropes to achieve his 6996 test runs. Only six times in his 20-year test career did he hit a six, which makes The Don unmatched in consistently making runs without aggressively wielding the willow, and risking his wicket. 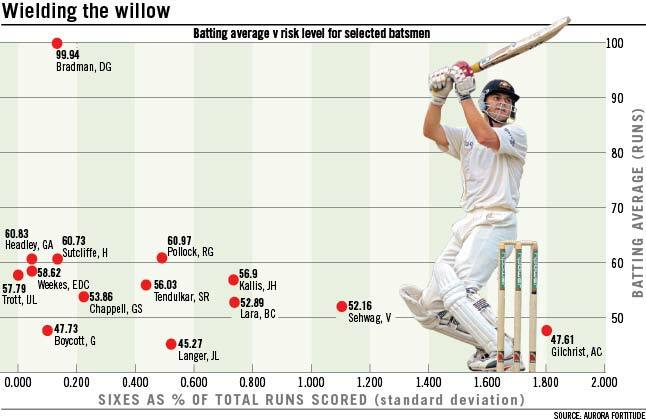 On the risk return scatter-plot of test cricketers, Sir Donald is an outrageous outlier. In the Twenty20 era of the game, such doggedness in run-making might not get backsides on seats, but in the hedge fund arena it’s the Bradman-esque managers who are getting funds through the door. “Everyone has learned that if you are getting spectacular returns it’s coming with spectacular risk and you just never know when it’s going to show up,” says John Corr of Aurora Fortitude. The changing mindset of investors towards hedge funds is best illustrated in the fortunes of two of the world’s most heralded funds – John Paulson’s Advantage Funds and Ray Dalio’s Bridgewater Associates. Paulson is known for a spectacularly profitable bet against US sub-prime. But a horrible run since has seen his assets plunge from $38 billion to below $20 billion as his positions on the banks, goldminers, and the occasional fraudulent stock, went against him. Paulson has since given back about half of his sub-prime winnings. Bridgewater, by comparison, has ticked along at a steadier pace, amassing a staggering $120 billion of funds under management (more than four times the entire Australian hedge fund industry). More pension funds globally are appreciating what Albert Einstein described as “the most powerful force in the world” – compound interest. And to harness its full power, managers need to deliver stable returns. Hedge funds and other alternative managers that can smooth out the swings inherent in markets are in higher demand than ever. The evolving attitude towards risk and returns in the hedge fund community is manifesting itself in the broader debate among local superannuation funds about their approach. On Wednesday evening, the Alternative Investment Managers Association hosted a panel of experts in Sydney to discuss what asset allocators can learn from hedge funds and vice versa. An overriding theme was the need for funds to adopt the hedge funds’ obsession with managing risk above a dogmatic adherence to a pre-programmed mix of assets. Local superannuation funds have unfortunately been more Paulson than Dalio in the past five years and are still struggling to claw back large investment losses as a result of a large weighting towards equities. This has prompted soul searching in the industry as to whether the approach to managing pensions needs a complete overhaul. But the crux of where asset allocation has gone wrong is not whether the fund was delivered a bad outcome. It is how it has performed relative to its “strategic asset allocation”, said one panellist. There appeared to be almost universal agreement that funds needed to think of investment returns more in absolute sense rather against performance benchmarks. Presentations on the concept such as “risk parity”, which stresses the budgeting of risk rather than capital, are common in investment conferences attended by local superannuation funds and asset allocations. Hedge funds such as Bridgewater have demonstrated the effectiveness of a “risk parity” approach through their strong performance during the financial crisis. Panelists also spoke of the flexibility of hedge funds to unlock value with the massive weighting to cheap credit in 2009 cited as an example of the advantages of hedge funds over traditional managers. But there are drawbacks in placing too much faith in hedge funds, particularly when it comes to fees and the misalignment of incentives between the hedge fund manager and its clients, particularly in more benign market conditions. The reality is the divide between alternative asset managers and traditional managed funds. Hedge funds are becoming more institutionalised and mainstream, to attract and retain capital, while managed funds have to expand their offerings and skill sets to retain it. Australia’s hedge fund community will gather at the Ivy Ballroom in Sydney this evening for Hedge Funds Rock, their annual charity and awards gig. More than $2.5 million has been raised for Cure Our Kids since hedgies first shaved their heads to raise money for children with cancer in 2001. In 2012, Australian hedge funds are fighting their own battle for the attention of cashed-up institutions, which are scaling back their exposure to hedge funds or opting to side with large global players. Assets under management for Australian hedge funds are about $43 billion, just a drop in the bucket of a global $US1.74 trillion industry that is concentrated in America. While total superannuation funds under management are believed to be nearly $2 trillion, institutions allocate the bulk of their estimated 3 per cent invested in hedge funds to offshore managers. The nation’s largest pension fund, the $76 billion Future Fund, has a stronger preference for hedge funds, allocating $11.9 billion – but again, mainly to international managers. “Large allocations to hedge funds are still made from US pension funds but we’re seeing very little of that flow in Australia,” Aurora Funds Management chief investment officer John Corr says. Even investors agree. “They [local institutions] pretty much ignore the industry,” Media Super chief investment officer Jon Glass says. Corr says local institutions allocate to the larger international brand names, even if their risk profiles are similar to Aurora’s or not as good. “It seems to be a belief that these things can’t be done in Australia,” he says. Sunsuper is one of the higher allocators as 7 per cent of its balanced option is in hedge funds, but Bennelong Asset Management is its only Australian manager in a portfolio of 20 funds. Sunsuper was previously invested in Everest Financial Group – a local fund that is winding up after being hit by a leveraged client base during the credit crunch and legal action. “Some Australian managers are very good, but the universe is more limited,” Sunsuper chief investment officer David Hartley says. “There isn’t as much scope for managers to hedge positions but in the US there is more choice and flexibility. A number of institutions were exposed to fund of funds [an investment strategy] and it did not always meet their expectations,” Hartley says and adds Sunsuper used Everest mainly to facilitate introductions to offshore hedge funds. Frontier Advisors deputy director of consulting Kristian Fok points to greater opportunity for offshore players, given that hedge funds seek to profit from market dislocation. Consequently, Australia’s greater fiscal responsibility means fewer opportunities for local managers in the aftermath of the credit crisis. “Local institutions tend to be allocating to offshore hedge funds because opportunities are greater where the market dislocation is much greater,” Fok says. He gives the example of non-conforming loan portfolios – which represent rich opportunity for the hedge funds – that hold detailed information on borrowers. Depressed property prices and risk are priced into these packages. “If something is complex, you need to be sure the fundamental investment case makes sense before you rely on the skill set [of a manager],” Fok says. The local recalcitrance towards hedge funds is ironic since Australia gave birth to the asset class (trivia that won’t appear on a citizenship test). In 1949, Melbourne-based financial journalist Albert Winslow Jones began using the wonders of leverage and short selling to make returns independent of the broader direction of the stockmarket. His experiment earned him the title of the father of the modern hedge fund. Jones’s legacy lives on with Australians such as Greg Coffey, Michael Hintze and Hilton Nathanson, who are among Britain’s wealthiest hedge funds managers, according to the Sunday Times Rich List. Despite the achievements of these Australians, Aurora’s Corr says very little of the allocation to hedge funds by local investors and US pension funds flows in Australia. Oliver Mauger of Perpetual Investments spent several years working in Switzerland – the first jurisdiction to embrace hedge fund investing. He agrees that Australia’s industry is still in a burgeoning phase, trailing behind the centres of New York and London. But he sees hedge funds as growing in importance as Australian funds come to terms with the global financial crisis. “We are talking about it as an asset class but it’s a huge, heterogeneous universe of many different strategies. Hedge funds are a structure that allows you to take different types of risk out of the market,” he says. 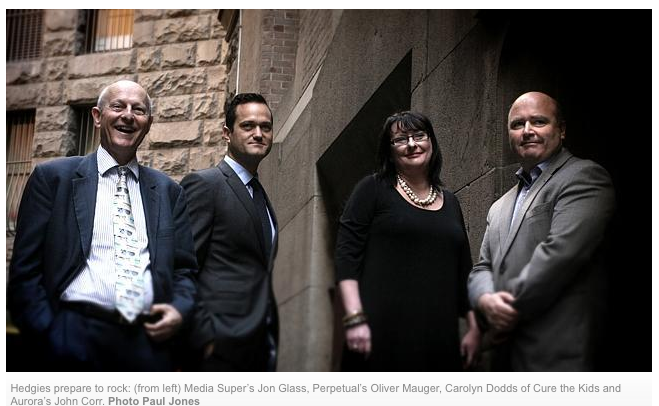 Media Super’s Glass says the emergence of hedge funds comes amid serious soul searching among superannuation funds about their approach to investing. The loose strategy of broadly allocating money to equities whilst “playing around on the edges” had served funds well for close on 15 years, he says. But it stopped working in 2008 and there’s division as to whether retirement money management needs an overhaul. “There are those that think it will start to work again any day soon and there are those that think, ‘Hang on a second, there’s a bigger world of securities out there, and there is more to access in the capital structure than just equities’,” he says. We are pleased to advise that two of Aurora’s investment funds have recently been nominated for various prestigious Australian and international awards. The Aurora Fortitude Absolute Return Fund has been nominated locally as Best Market Neutral Fund for both the Australian Hedge Fund Awards 2012 and also the Professional Planner/Zenith Fund Award 2012. The Fund has also been nominated for the international AsiaHedge Awards as “Best Single Country Fund”. In addition, the Aurora Sandringham Dividend Income Trust has been nominated for the Professional Planner/Zenith Fund Award 2012 under Alternatives – Other category. These nominations reflect the experience, expertise, and success of the Aurora investment management team. On Monday 2nd July, John Corr, Chief Investment Officer at Aurora Funds Management says the regulatory probe into the failed EB Private Equity play for David Jones could lead to a broader review of stock price and management manipulation. From 8 February 2012, the Aurora Absolute Return Fund (ASX Code: ABW) will no longer charge a Contribution Fee for Applications received through the Product Disclosure Statement.